As I mentioned in a previous post, the language of sailing presents a challenging entry point for newbie sailors like me. The language is foreign. And, to complicate matters, sometimes many different words are used to refer to the same item. For example, just today, I’ve heard the rotating middle of a Portland plotter referred to as a bezel, protractor, compass, and a “twiddly bit“. Even the pronunciation of words varies depending on where you live in the world. My RYA on-line Day Skipper theory course, offered out of the UK, would have me say leeward as “looward”. But, to me that pronunciation sounds like a swashbuckling pirate. Here in North America, I think I’ll stick with long-e “leeward” pronunciation and see where that gets me. Previously, my impression of sail boats had been child-like drawings of mast and sail, and a confusing amount of ropes going every which way. Even after attending the US Sail Boat show in Annapolis, MD, I was surprised to consider the engineering that goes into building a boat. 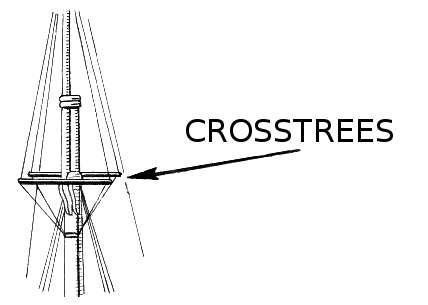 I didn’t know, for example, that the mast does not support itself, the forestay and backstay are needed to keep the mast aloft (front to back). And, the shrouds, previously known to me as something worn by the dead (funeral shrouds) are actually strong lines that support the mast from side to side. Likewise, I had never noticed the modern-day spreaders on the mast that add support to the sails. I had associated crosstrees – the horizontal struts that anchor the shrouds – with Disney-like pirate ships, not modern-day catamarans. Another surprise to me was that the sail size itself can be adjusted – reefed, if you will. I had thought a sail was either up or down. No in-betweens or variants. Adjusting the sails seems obvious in hindsight. Fortunately, this learning came to me at the same time that my husband was sail racing for the first time at the Mount Gay Rum Round Race 2015 with Ondeck sailing. His experience with the coffee-grinder winches suggests to me that I will be spending a fair bit of time reefing the sails when I go to Antigua Sailing Week in April 2015. I recognize that theory is no substitute for experience. But, I am in Ottawa, Canada right now with many feet of snow on the ground, and a windchill of -25C (-13F). So, theory is where it’s at for me right now. The fantastic thing is that there is no shortage of sailing information available. If I don’t understand something I can search on-line and quickly find answers. And, on that note, I will leave you with a Youtube video that I really enjoyed watching today. In this video, Mike Whitehouse, Senior Sailing instructor of Halifax, Nova Scotia, describes how to use the Portland Plotter for navigation. Previous Hair cut and new glasses – ready for sailing! Next Where to anchor at Namely Harbour?